The SSL-SMOKE detector is a device, which connects with SSL-EMD. When smoke is detected an alarm will sound alerting the users. Through the SNMP-SSL card, the user can monitor it and receive notifications of the alarms. 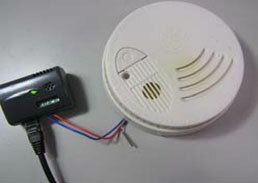 This type of AC/DC smoke detector can be powered by 120VAC utility power or a 9-volt battery. AC/DC smoke detectors offer added protection in the event of a power failure or a dead battery.